I just got back from the first ever Food Allergy Bloggers Conference in Las Vegas, NV. It was a fun, educational, and inspiring two and half day event that took place at South Point Hotel, Casino, and Spa. Jenny Sprague author of Multiple Food Allergy Help and Homa Woodrum author of Oh Mah Deehness are the two masterminds behind the creation of this conference. Thank you Jenny and Homa for the many, many hours it must have taken to pull off such a successful event. Unfortunately I wasn’t able to attend all of the sessions, one in particular by Dr. Michael Pistiner with Allergy Home. I was fortunate enough to hear Dr. Pistiner speak at the USAnaphylaxis Summit hosted by AANMA in October. 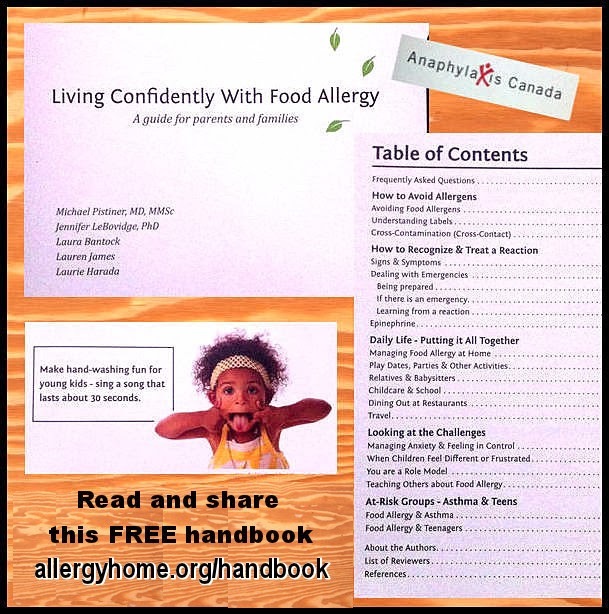 One of his projects is a guidebook, Living Confidently With Food Allergy, which I would love to see in every food allergy household. This free guidebook, in my opinion, should be handed out to all newly diagnosed patients. Did I mention there were fantastic give-aways too? I had my eye on the KitchenAid Stand Mixer with no such luck. However, Tanya with Allergy Mentor was the lucky winner of this KitchenAid appliance. I think she was a little excited. What do you think?? If I had to pick one thing that was my favorite about attending #FABlogCon (which is how it is known on Twitter), it would be the ability to meet and reunite with so many like-minded individuals who all share the same passion. As Donna DeCosta wrote in her post ‘FABlogCon was Fab-ulous!’, we are now known as the FAB family. An example of this FAB family can be viewed on Erica Dermer’s video at Celiac and the Beast. I would like to thank my husband, James, for believing in me. He not only took the time out of work to accompany me to Vegas but he also never once batted an eye when paying all of the bills that made it possible. Thanks babe. Last but not least a HUGE thank you to my mom, Ellen, who stayed at home with my boys. Her understanding of my son’s allergies and the importance of epinephrine use is what made it possible for me to go half-way across the country with confidence. Love you Mom! I think, directly outside they had a cafe where they serve snacks and wine- although we went the cheap route for dinner (a food truck on the side of the street!) I want to come back here again.